You can use a variety of wedding invitation kits to help create your wedding invitations while planning your wedding. These easy to use kits allow you to create personalized invitations based on card stock and images, so you can use your imagination to create any style of unique, traditional, or classic invitations to send to your guests. While wedding invitation kits can help you save money, they can also help you to add a personal or artistic touch to your invitations. These kits typically come in assorted colors as well as a variety of themes. 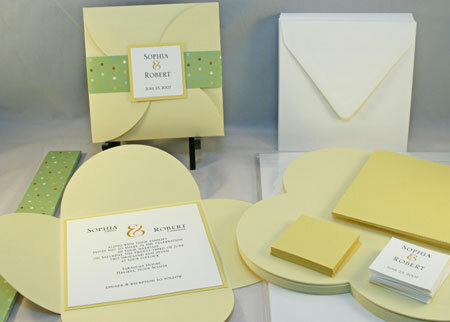 Wedding invitation kits come in many styles and designs including pocket invitations. This creative design allows all the separate cards for the reception, RSVP, and directions to be included in a pocket. This keeps them all in sight and accessible for the guest. The return envelopes are also kept in the pocket with the corresponding card, making everything easy to access. When you are using a kit to create your wedding invitations, you can choose the graphics you want to use. 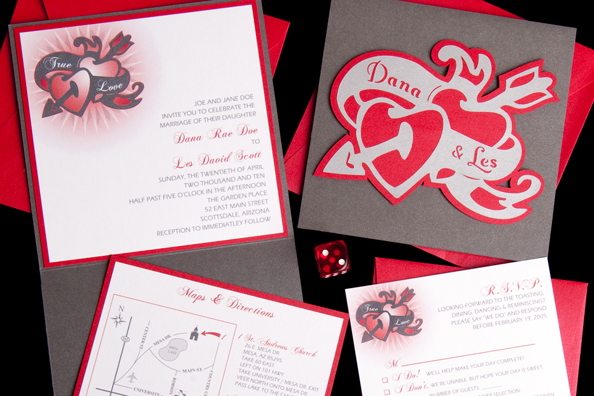 From hearts to flowers to cowboy boots, you can add different graphics to each part of the invitations. Kits with various graphics to choose from give you the option of adding fun to your invitations. You can decide on fancy or simple graphic to enhance your invitations and can even design different invitations per guest if you have the time. 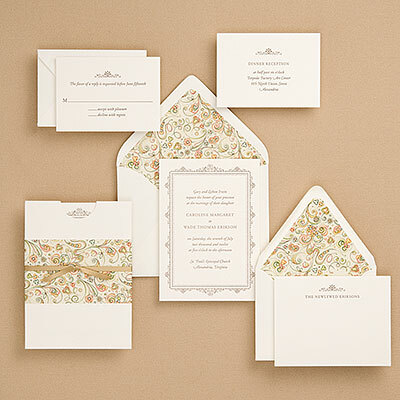 Some wedding invitation kits have an elegant style. They are embossed, have ribbon accents, and rich colors. Some have added rhinestone accents that add to the glamor. 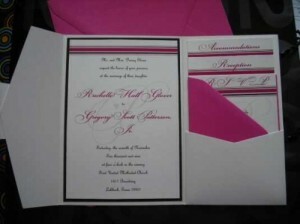 You can choose a design with a mixture of plain backs and designed fonts or go with bright colors for your invitations. Some cards even have ribbons that hold them closed. 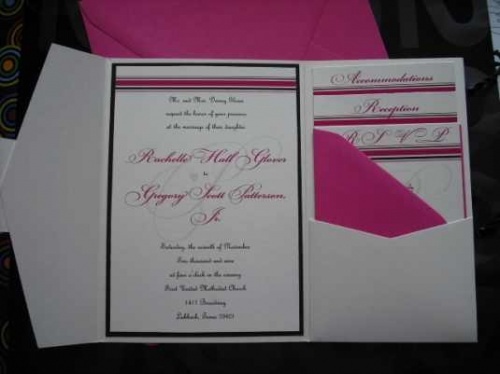 While envelopes are square or rectangle, that does not limit the shape of the invitation. Some kits have square cards for the ceremony, reception, and maps with a scalloped shape that folds up to fit into the square envelope. When opened these create a flower like appearance that can be very unique. Depending on the time of year these can be snowflakes, flowers, or just geometric patterns. Some wedding invitation kits come in complete sets so that you have everything you need for creating beautiful invitations for your guests. Complete sets can come with cards for the reception, RSVP, directions, save the date, and thank you cards and images and graphics you need to decorate. 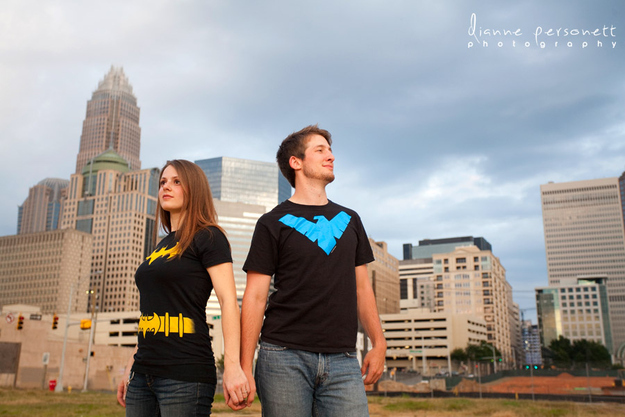 Some larger cardstock may be included for the actual wedding invitation. You will have necessary materials for address labels, labels, and table cards. Envelopes to match are also included in the complete sets. 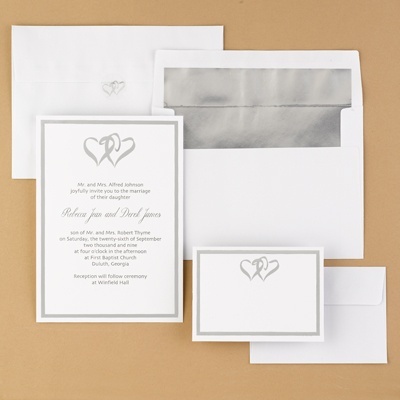 You can choose a simple yet elegant kit for your wedding invitations with foil lined envelopes. 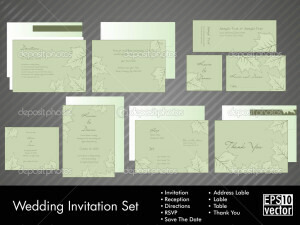 The designs of the invitations can vary as well as the color of the foil lining. Some have a simple postcard type design for the invitations and thank you cards as well as the RSVP cards. Some styles have borders around them and are accented with hearts. Foil is a unique look, and often a nice surprise for the guests. 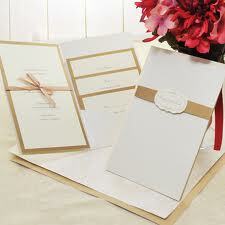 You can choose floral wedding invitation kits for a more decorative lining. The envelope lining comes in a floral design. Sometimes there will be a matching floral accent band on the folded invitations, a small ribbon holds the card together or even borders that have scrollwork on some of the cards. There are plenty of floral options, so look around until you find something that you like. Some kits used for making wedding invitations use bows as decorative accents. 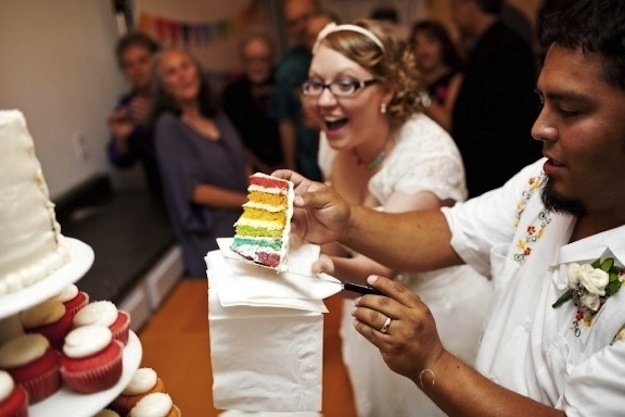 Some bows hold the invitation closed and others are purely decorative. Sheer bows can add a hint of romance to the cards while some satin style bows add a touch of elegance. You can find kits with bright, vibrant, and bold colors including cranberry and watermelon. 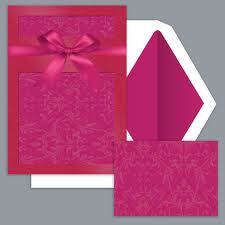 Envelopes with matching linings and the bows stand out and some also have a decorative floral scroll design. 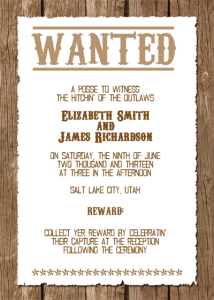 A fun selection of wedding invitation kits is a wanted poster design which is ideal for a western themed wedding. The invitations are printed like old fashioned wanted posters with photos and names, or dates, added to them. 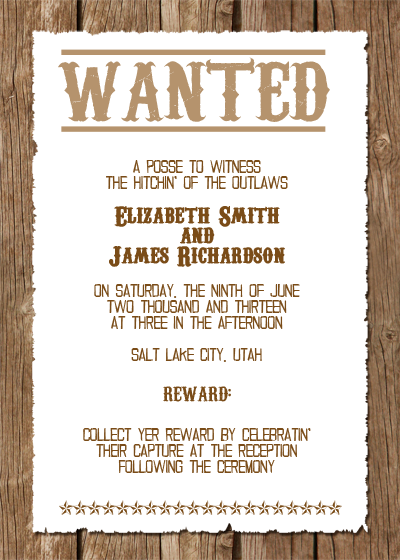 Other western style invitations have cowboy hats or boots on them. 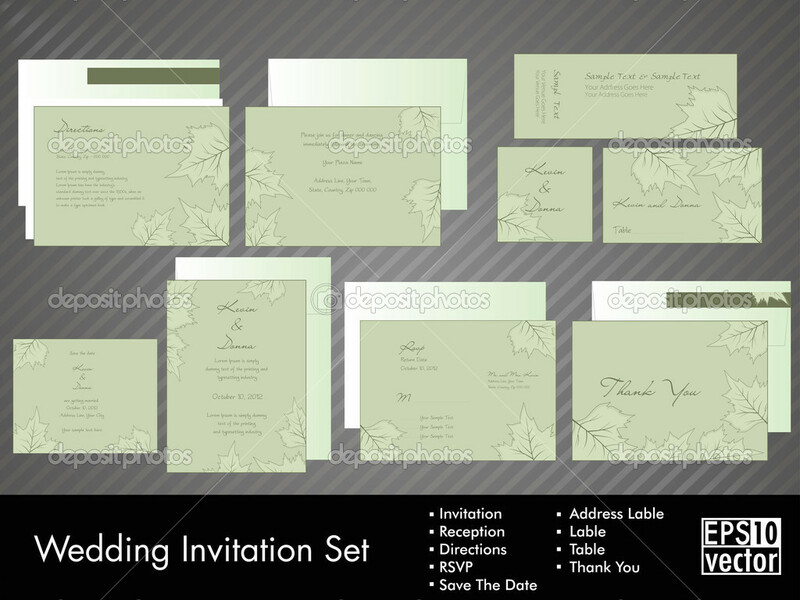 A popular design for wedding invitations is a photo invitation. This style is typically a postcard design with a photo behind the printing. Some have accent bows or borders. There are some with the photo at the top or bottom and the printing above or below the photo. 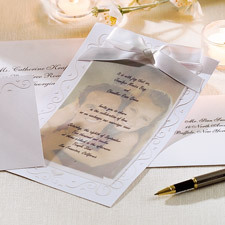 Photo invitations allow the bride and groom to personalize their invitations with photos of themselves so that the guests immediately recognize the invite.